The Radiological Society of North America (RSNA) has selected ProduXion Manager to manage production workflow for their journals Radiology: Cardiothoracic Imaging, Radiology, RadioGraphics, Radiology: Artificial Intelligence, and Radiology: Imaging Cancer as well as their magazine, RSNA News. Learn more about ProduXion Manager in our video library. Radcliffe Group has selected Editorial Manager to manage their submission and peer review workflow for their journals Arrhythmia & Electrophysiology Review, Cardiac Failure Review, European Cardiology Review, Interventional Cardiology Review, US Cardiology Review, and Vascular & Endovascular Review. Aries Systems is pleased to announce that LetPub will join a growing list of submission partners using the Editorial Manager Ingest Service. LetPub will utilize Editorial Manager Ingest 2.0, the updated and improved Ingest Service which features greater workflow visibility, access to more detailed notifications, and streamlined revision submission. Read more. the event’s focus is Diversity and Inclusion in Peer Review. To celebrate Peer Review Week, we’ve curated a list of our favorite Editorial Manager tools and integrations that support peer review. Read more about Peer Review Week and follow along on Twitter. 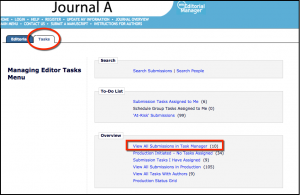 Journals can push submitted manuscripts from Editorial Manager directly to preprint servers using a workflow task. Watch the video to learn more. 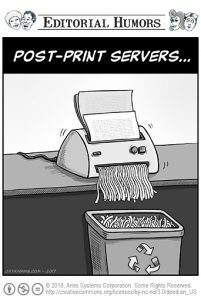 Editorial Manager also accommodates the opposite workflow, in which manuscripts are transferred from preprint servers into the system. Learn more. With the most recent release of Editorial Manager (version 15.0), journals were upgraded to the new Xtract submission interface with automated metadata extraction. “I attribute the success [of the new interface] to the Aries staff, who took the time to develop the new system, get feedback from users, and provide informative resources well in advance of the transition.”Learn more about Xtract. 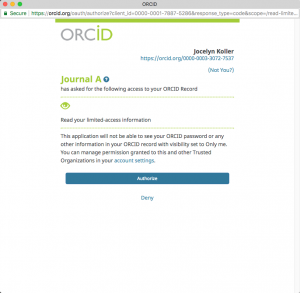 ORCID member organizations can choose to display their own institutional branding at ORCID integration points in Editorial Manager. Simply provide Aries with your organization’s ORCID credentials and your branding will be displayed when the ORCID screen is triggered. Watch the video. Journals often need to initiate tasks during the editorial workflow. In Editorial Manager 15.1, task functionality can be accessed without initiating production. This helpful feature allows tasks such as language edits, copyright checks, conflict of interest form deposit, and preprint server deposit to occur in parallel right from the time of submission. Learn more or see Task Manager in action in our latest video. During submission, authors are frequently asked questions about their manuscript. In Editorial Manager, author responses to these questions can be automatically assigned flags which appear in the Editor interface. This feature makes it easier for Editors to make quick visual assessments during workflow. Watch the video.